A video is circulating on Youku of a man purporting to be a former surgeon at a Beijing hospital, explaining how the red envelope bribe and commission system works in China. 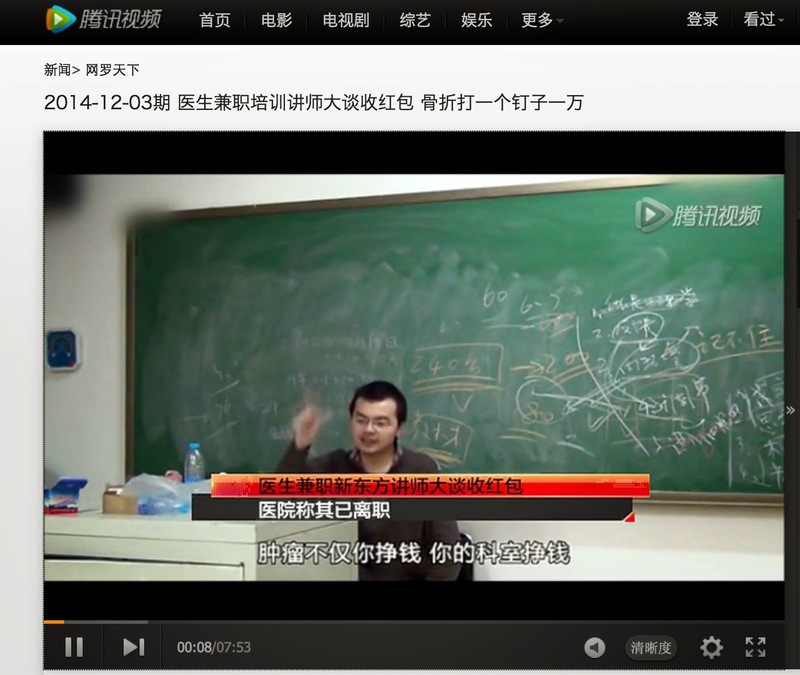 The erstwhile doctor, claimed to be Li Rui of the Beijing Aerospace Institute Hospital Urology department. He said that during his time working in surgery, doctors would make huge commissions by charging patients exhorbitant sums for ancillary items such as a 1500 yuan gauze pad to stop bleeding, on which they earned a 30% fee. He said surgeons performed many simple operations such as removing appendix in 10 minutes and then adding lots of expenses to the bills. Dr Li said it was best to work in procedural specialties such as orthopaedics, surgery and obstetrics where there were more opportunities to perform operations and use expensive medical supplies and devices. The man was purportedly giving a presentation at the well-known New Orient academy in Beijing, although the institute denied any knowledge of his working there. In a statement the Beijing Aerospace Institute Hospital denied the man's claims, describing them as baseless and slanderous. The hospital said there had been a Dr Li working at the hospital but he had been absent for six months and thus his contract was terminated. The hospital said the man's statements on video lacked credibility, citing as an example that there was no way a surgeon could do an appendix removal in 10 minutes, even with the most modern equipment. However, the video has been widely circulated on Chinese social media sites, drawing comments on the greed and corruption of doctors and the profit-seeking nature of public hospitals.